MAZDA CX-3 Crossover Entry Remotes are very convenient feature. 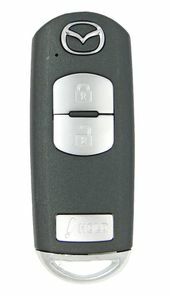 Remote control transmitter can lock and unlock your door locks. Late model Mazda CX 3 SUV key fobs combine a remote function and engine start transponder high-security key. Now your key fob and key are just in one piece. Getting replacement car remotes and transponder car keys are not cheap, but now you can save huge discount.